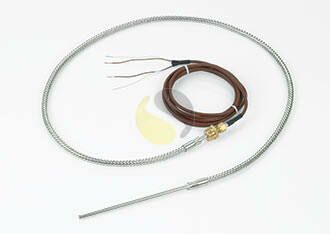 Thermocouple load sensor designed for harsh environments found in autoclaves and sterilisers. 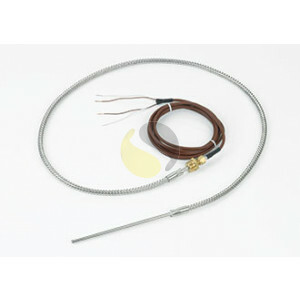 Autoclave load probes are available in thermocouple types T or K; the sensor is sealed within a 5.5mm diameter stainless steel sheath, 150mm long. The sheath is terminated into a 1 meter flexible conduit lead with internal silicone rubber insulated wires. The conduit is then sealed and fixed to a 5.5mm stainless steel bulkhead transition piece which allows a compression fitting to seal the chamber. A 3/8” BSPP Brass compression fitting is supplied as standard although other sizes are available. 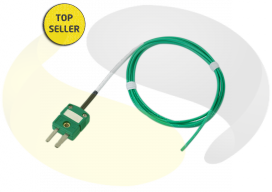 The sensor comes complete with a 2 metre silicone insulated flexible lead wire and 50mm tails. 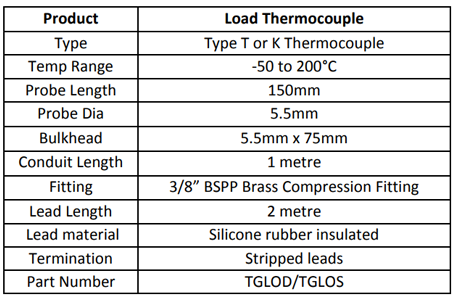 The thermocouple is supplied in either simplex (single sensor) or duplex (dual sensors) versions. The construction is designed to stop the ingress of moisture from steam or liquid in the high pressure environment of autoclaves.